With this post, I'm wrapping up my first batch of Masters of the Universe variants re-cast as new characters. There are still a lot of variants to tackle (and I will! ), but for now I've covered the main classic variants. 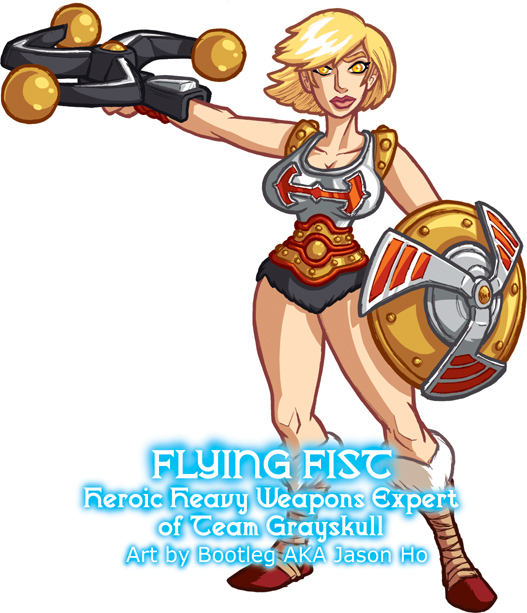 Allow me to present a lady codenamed Flying Fist, with accesories and armor courtesy of Flying Fists He-Man. Adeline's mechanized triple flail can pulverize granite and break solid plate armor, while her rotating shield is capable of generating a defensive barrier of wind, or firing an offensive whirlwind blast. When held aloft, she can utilize it as a limited one-person helicopter, and in the past she has also used the shield as an improvised boat propeller. The flail and shield are both semi-magical items, requiring the input of the user's chi for proper use. HISTORY: Adeline hails from a serene and remote village in the foothills. Her mother Adele was famed amongst the locals for using her tremendous strength as the village's protector, earning her the nickname "Flying Fist." For the most part, the village was peaceful, and Adele used her strength for mundane tasks such as helping with construction and demolitions and clearing fallen trees. Occasionally some small-time bandits would show up, or a bear would wander too close to town, but all in all it was a peaceful existence. Adeline knew that her mother's strength came from the magic girdle, though her mother never explained where the girdle came from. And when Adele passed away, some five years ago, Adeline inherited the girdle and the role of village protector. It wasn't long before Adeline inherited the nickname "Flying Fist" as well. Following another dream-vision, Teela visited Adeline's village with Team Grayskull in tow. Adeline had long been in possession of a magically locked chest belonging to her mother, and with the help of Teela's magical powers, she was finally able to open it. The chest contained a breastplate marked with an ancient heraldic symbol of Grayskull's line. After this, it quickly came to light that Thunder Punch was in fact Adeline's father, and like Thunder Punch, Adeline's mother Adele had once been a champion of Castle Grayskull. Initially, Thunder Punch was vehemently opposed to involving his daughter in the struggle between the protectors of Castle Grayskull and its would-be conquerors. However, the Sorceress convinced him that while it was not Adeline's inevitable destiny, it was the legacy of both her parents, and she had a right to choose for herself. Adeline had planned to reject the invitation to join Teela's group, but after witnessing a battle between Team Grayskull and some Horde Troopers, she understood the bigger picture--in order to protect her village, there was a bigger world outside of it that needed protecting as well. With a tearful goodbye, Adeline bid farewell to her village. Shortly after arriving at Castle Grayskull, Adeline came across a room with two broken and discarded mechanical devices. In her village, Adeline's strength made her ideal for carrying out repairs on large structures like windmills and water wheels, so she had developed something of a sense for mechanics--she tinkered with the devices a little, and was able to restore them to perfect working order, and even improved them with some minor modifications. Thus, the mechanized triple-flail and rotating shield became Adeline's primary tools in combat. When Team Grayskull isn't searching for He-Man or battling the forces of evil, Adeline often spends her hours trying to repair the ancient technologies contained in Castle Grayskull, with the "assistance" of Orko..
All things considered, Adeline has adapted to life with Team Grayskull rather smoothly. At times, her relationship with her father is strained, but overall, Adeline and Thunder Punch are both doing well in mending their estranged relationship. Teela has become a surrogate big sister to her, and Orko and Cringer are both very fond of her. There's something of a brewing romance between Adeline and Battle-Scar, at least when Battle-Scar isn't attempting to rile her up by calling her "She-Man." Such behavior generally earns Battle-Scar a punch in the nose. The magical breastplate is a nice touch! there's a lot of metal in that breast plate! There's a lot of breast in that breastplate! lol... thanks everyone. i'm going to stop drawing 80's cartoon characters and just draw technical diagrams of sports bras from now on!